When conducting patrols, walking the beat and entering the field, weapon security is paramount safety and success. The new Model 6377 ALS Belt Holster delivers the enhanced weapon retention and rugged durability you need to enter any mission with confidence. The holster's body is constructed from injection molded polymer, providing a precise fit that is shaped to match the exact contours and dimensions of the weapon being carried. Once holstered, a powerful automatic locking system (ALS) takes over and secures the pistol into place where it can only be released using a thumb activated switch. The release trigger is strategically located on the inside of the holster, eliminating the threat of enemy combatants being able to steel the weapon during a close quarters altercation. A high-ride close to the shooters body allows for maximum concealment and comfortable carry. Safariland makes great duty holsters-never disappointed. My Sig 228 draws quickly from this. Exactly what I was looking for It arrived very quickly and the customer service was outstanding. Works to design and intent. Secure on belt, easy draw. Very good holster for the price. Retention system is solid. Sits a little bit higher on waist than I thought it would, but not enough to impede a smooth draw when wearing body armor. Excellent holster. I'd definitely recommend it for anyone that open carries and wants a good retention holster. Superb holster fit my S&W M&P 4.25" Pro Instantly, no adjusting required. Holster does everything exactly as advertised. Lightning fast draws and holstering. Holds gun rock solid secure. As soon as I put it on my belt I performed 50 draws and holstering in a row as quickly as I could, holster and thumb brake worked superbly and smooth as glass. I can not believe a holster that works so can also be this affordable. Would recommend this holster to anyone looking for a superb thumb brake level II retention holster. Love it Fits my dress belt fantastic The als release is smooth Would buy it again. Works great and does a nice job distributing the weight of a Sig P226R & Surefire X300 Ultra. One note, the X300 Ultra is slightly longer than the standard X300. I had to push out the plastic lens protector at the bottom of the holster but it still works great and there's enough protection for the lens when you're sitting down. It holds my Springfield XDM 4.5 barrel very well. It is comfortable, and with the "Galco SB2 1.5" belt it holds it close to my body. The release button took only a few minutes of practice to become familiar the operation of the system. I feel confident knowing this holster will give me years of safe & reliable service. You can make adjustments if needed for ease of draw, however in my case none were needed. This is a quality product in my opinion. Fits my glock 17 and 22 with TLR1 perfectly. Excellent product and fast ship. Awesome holster. Great Safariland quality coupled with excellent CopsPlus price makes this a sure win. Great holster As a detective the added security is amazing. I carry a Glock 27 in this holster. The holster is snug and comfortable. I do like the simple security feature on this holster easy to draw as well. In the future, I might be buying one for my Sig P229. Ordered this holster for a Sig P226R with a Surefire X300 ULTRA. The gun and light fit fine and engage the ALS retention without a problem but I had to push the plastic piece that covers the lens out in order to make it fit properly. Not a big deal and easy to do but keep this in mind if you're running the X300 Ultra as it is slightly longer than the standard X300. Will the Safariland 6377-320-411 fit a standard RCMP S&W 5946? 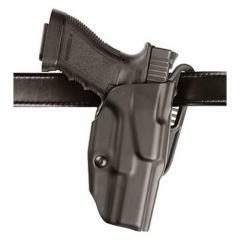 This is a concealment holster and is not rated for duty use so there are no levels. Will this holster fit a rock island armory 45 tactical with 5" barrel? It should fit if you select "Kimber Warrior with Light Rail". Hi just making sure this holster will work with the 4th generation glock 27? Also, says the holster has a locking mechanism? Does that mean a lever needs to be pressed in order to get the weapon out? Correct. It will work with the 4th gen Glocks and there is a lever to depress before you can draw.